You are here: Home > Uterine rupture: how much time do you have to save the baby? Uterine rupture: how much time do you have to save the baby? A new study to be published in the April issue of Obstetrics and Gynecology demonstrates that in the wake of a uterine rupture, providers have no more than 18 minutes to deliver the baby before the baby experiences significant hypoxia, and only 30 minutes until the baby suffers major neurological impairment. The paper, entitled Uterine Rupture With Attempted Vaginal Birth After Cesarean Delivery: Decision-to-Delivery Time and Neonatal Outcome by Calla Holmgren et al. was undertaken to provide the most accurate information possible about the conditions needed to make attempted vaginal birth after cesarean (VBAC) as safe as possible. The increasing rate of primary and repeat cesarean delivery in the United States is of concern to physicians and patients, and vaginal birth after cesarean delivery is considered to be one way to lower the overall cesarean delivery rate. Trial of labor after cesarean delivery (TOLAC), which peaked at 31% in 1998, has decreased progressively since (8.5% by 2006), primarily because of issues surrounding uterine rupture. Although rupture of the uterus during TOLAC is rare, it can be devastating for both the mother and neonate when it occurs, and it is a major liability risk for physicians. The American College of Obstetricians and Gynecologists’ guidelines advise physicians that TOLAC is most safely undertaken in hospitals where staff can immediately carry out an emergency cesarean delivery. This view is based on the premise that the ability to rapidly intervene will minimize adverse neonatal outcomes. However, immediate availability is loosely defined, and it is not clear how rapidly the fetus must be delivered after uterine rupture to prevent neonatal death or neurologic sequelae. The purpose of this study was to examine whether an association exists between neonatal outcomes and the time from diagnosis of uterine rupture to delivery of the neonate. In other words, should hospitals refuse a trial of labor to women with a previous C-section if they cannot guarantee that both an obstetrician and and anesthesiologist are on site to start a C-section with less than a half hour? What did they look for? The primary adverse outcome was defined as an abnormal umbilical pH level less than 7.0 or a 5-minute Apgar score of 7 or less. Secondary adverse outcomes included fetal or early neonatal death and neonatal neurologic injury attributed to uterine rupture. Neonatal neurologic injury was defined as otherwise unexplained seizures, clinically obvious cerebral palsy, or developmental delay attributable to hypoxia resulting from the uterine rupture. Within the 10 hospitals studied, 40,772 women were identified with a prior cesarean delivery between January 1, 2000, through December 31, 2009. Of these, 11,195 women (27.5%) attempted TOLAC, with successful vaginal delivery for 9,419 (84.1%) patients… In total, there were 36 cases of documented uterine rupture (0.32%) during TOLAC. Seventeen neonates (47.2%) were delivered less than 18 minutes after identification of uterine rupture. Of these, two neonates had an abnormal 5-minute Apgar score, but both of these neonates had an umbilical pH level greater than 7.0 and none had neurologic injury. 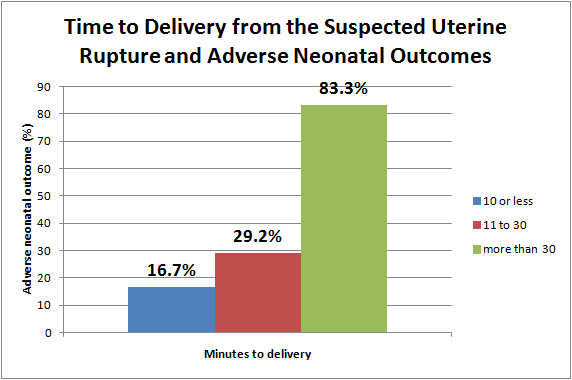 Eighteen patients were delivered more than 18 minutes after suspicion of uterine rupture (50.0%). Of these, 11 met criteria for a primary adverse outcome and three met criteria for an adverse secondary outcome. One patient did not have suspected uterine rupture during labor. A chart of the data makes the relationship between time to delivery and risk of adverse outcomes quite clear. More than 83% of babies delivered more than 30 minutes after uterine rupture experienced major neurological complications. This is an important study that has the potential for wide impact. The study strongly confirms the ACOG recommendation that babies should be delivered as soon as possible in the wake of a uterine rupture. 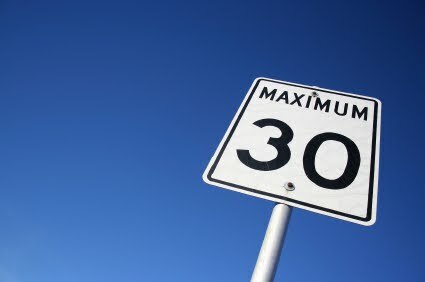 Intervals longer than 18 minutes resulted in demonstrable hypoxia and intervals longer than 30 minutes resulted in major neurological impairment. Studies like these make it extremely unlikely that hospitals and malpractice insurers will liberalize access to VBAC. My uterus ruptured during a TOLAC. From the time the monitor was removed with my son in distress to delivery was 29 minutes. Lachlan was stillborn and could not be revived. The UR was across my previous CS scar and then diagonally up to the top of my uterus, like an upside down 7. Lachlan was delivered from my abdominal cavity. The tear occurred directly below where the placenta was attached causing a complete lack of oxygen to him. I believe the complete rupture occurred when they had me move myself across to the bed to go to theatre, I remember intense pain and the feeling of Lachlan rolling over inside me. I knew something was wrong and remember screaming I was dying and to save my baby. Hindsight and research tells me the rupture had probably begun earlier when I was having unexplainable shoulder tip pain. I was in theatre for over 5 hours while the team repaired my rupture and washed out my system as Lachlan had passed meconium inside me. I was told the tear was only 5mm from the uterine artery. Thankfully the repair was successful and I went on to have another baby 18 months later, but my daughter can never fill the hole in my heart left behind. It was discovered during my CS with my daughter that my uterus had begun to tear again and it was recommended that i not have any more children. Uterine Rupture may be rare but it can have desvastating consequences and should not be dismissed lightly. It bothers me that those who dismiss the risks so easily are usually the same as those who refuse to vaccinate their children due to risk of autism. UR is a real and proven risk yet, there is no data proving vaccination can cause autism. Thank you for sharing your and Lachlan’s story. Oh Amanda, I’m so sorry.